Home » Budget » Who’s Afraid of the Budget Deficit? 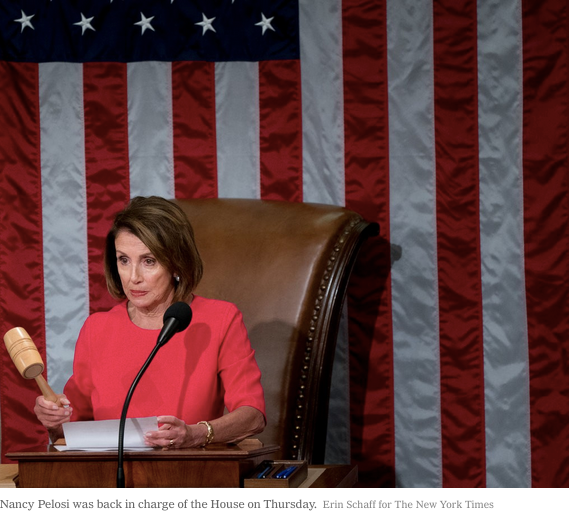 On Thursday, the best House speaker of modern times reclaimed her gavel, replacing one of the worst. It has taken the news media a very long time to appreciate the greatness of Nancy Pelosi, who saved Social Security from privatization, then was instrumental in gaining health insurance for 20 million Americans. And the media are still having a hard time facing up to the phoniness of their darling Paul Ryan, who, by the way, left office with a 12 percent favorable rating. But I think the narrative is finally, grudgingly, catching up with reality. The issue in question is “paygo,” a rule requiring that increases in spending be matched by offsetting tax increases or cuts elsewhere.